Parisian charm is in full bloom with the Sorbus Tricycle Plant Stand! 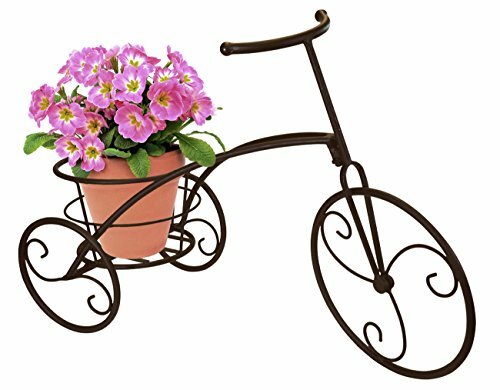 Pedal your way into a beautiful garden with decorative flowers, plants, and assorted greenery. This adorable tricycle plant holder features classic Parisian style completed with a round basket in the rear and scroll wheel details. Perfect for plant lovers, this stand adds a whimsical focal point to any home, patio, or garden. Decorate any indoor/outdoor space whether it's a suburban patio, country farmhouse, or city high-rise terrace. Transform a garden into a private escape with blooming begonias, gardenias, and other plants for a beautiful hideaway. During a patio brunch, exhibit your green thumb with a well-curated display of potted greenery on each tier. The basket holder is strong enough to hold potted plants and makes a great place to stash garden tools while you work. Indoors, feature houseplants near a sunny window, screened patio, or beside the front door to greet guests. Fill with poinsettias during the holidays, cactus plants for a nature-inspired vibe, or orchids for a crisp, modern look. The possibilities are endless! Head to your local nursery! This charming planter stand is durable enough to withstand use for several seasons.